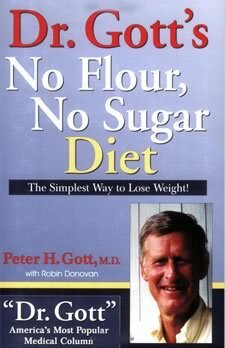 Dr. Gott’s No Flour, No Sugar Diet is a weight-loss program developed by medical practitioner and health columnist Dr Peter Gott. His best-selling book of the same name shows how to reduce calories in your diet by eliminating flour-based and added-sugar foods. He believes that these highly processed foods are the primary reason Americans are so overweight and so unhealthy. By eliminating foods filled with flour and sugar, dramatic weight loss results can be realized. Foods containing added sugar and refined flour are nutrient-poor, unlike foods containing whole grains, fruits, vegetables and legumes which are rich in vitamins, minerals and fiber. The No Flour, No Sugar Diet reduces the so-called ’empty’ calories of refined carbohydrate-based foods, also frequently high in fat (such as pizza and donuts). The No Flour, No Sugar lifestyle encourages selection of foods without significant sugar and refined flour content, based on interpretation of food labels. Exercise is also mentioned (half an hour a day). No counting of calories is suggested, however the book does list foods to major on and foods to avoid. The No Flour, No Sugar diet retails for $14.99. Most people who eliminate from their diet foods containing refined flour and sugar will lose weight. These foods tend to be very calorie dense and just a small amount equates to a lot of calories. A No Flour, No Sugar Diet works by greatly reducing these high calorie foods, especially if they are replaced by a lot of vegetables and fruit. Gott, P. H. (2006). Dr. Gott’s No Flour, No Sugar Diet. RSM Press. Is there a version of this for vegetarians? I have done the no flour and sugar diet before. It works 100%. You will literally melt away. Once you cut the processed foods ( flour and sugar) you literally will have to make your self eat at times. Do it! I started the no flour no sugar diet plan in February of 2013. My weight at that time was 247 pounds 5 foot 10 in tall. And 8 months on the plan I lost 50 lb to get down to a weight of 197. In the 4 years since that time my weight stabilized around 208 lb. In between times being off the plan I was pretty good at still not eating very much flour sugar. I would say overall the plan is changed my life a lot. I’m returning to the diet in February of 2018. I’m rereading the book and will try to be faithful. Good luck to all of you it’s nice to be smaller and look different. I tried a no flour no sugar diet recently. I lost about 5-6 lbs. in the first 4 days. I got some withdrawal sypmtoms, but then after 10 days I felt FANTASTIC. I don’t know why I stopped it, but I really want to try to do it again. It’s hard to start day 1, but I need to. I have a fmaily to cook for, so it’s a bit of a challenge. Not that bad though, as you can still have brown rice and corn, and w/ me, low fat dairy was stilll allowed. I’ve been on this for almost weeks only with a few modifications. I eat whole wheat or whole grain flour products (pasta, bread, tortillas), not too much, but enough. I usually had my coffee with 2tsp of sugar and half/half so I switched to green tea for my caffeine. I’ve lost 5 pounds already! You hear this all the time, BUT it is KEY: Drink lots and lots of water whenever you think about it during the day. Green tea can dehydrate very quickly(as can coffee). I did a diet like this in 2006, never have I felt better in my life, I lost 130lbs. It is a commitment for sure but worth it! I started adding sugar and flour back in 07 and have struggled with it ever since. I have put weight back on, but I am realizing that eating sugar and flour free is really the only way to live. So I am going to start over, simply because of how amazing I felt!! hmmm… plausible diet option for me? my sister in law was on this diet, she lost 10lbs a week!!!! but she was really, really big, her waight loss has slowed down but thats because she doesnt have as much fat to loose. because of her i am now starting this diet for myself. I started june 6 2009 and by sept 6 I had lost 18 pounds..EXCELLENT PROGRAM……SUPER EASY TO DO TOO! My sister did this diet starting July 2008.. and to date has lost 47 lbs. She is 49 and tried all diets until this. It really worked for her. Go Mary! this way of eating (no sugar, no refined carbs)is also the BEST to lowering cholestrol numbers. I reduced my LDL of 168 to 126 (42 points) in about 5 weeks. My doctor was really impressed. I will continue with this way of eating as I have also lost 16 pounds (although the weight loss was not my priority). Give it a try, you will be happy with the results. I got unbelievably flat abs on this diet, and very lean legs. It’s excellent and not hard to follow at all. I’ve done this in the past. It helped me to lose the stubborn last pounds as well as clear up my acne. Just my skin, mind you, I’m not saying that’s a benefit for everyone, but it could work! I started nfns on sept.7,08.I don’t feel hungry.In these four days I neither loose nor gain. I cut all sugar and all artificial sugar and limited the flour but didn’t cut it completely and went from 136 to 126 in 30 days. The first 4 days were hard and day 4 was the worse but after that I had more energy and since then I have dropped to 120 in the following 6 weeks. Now, I have allowed myself some sugar but I am careful and I watch everything I eat. I also make sure I do not eat high fructose corn syrup. This was all done with little excercise. Now I have added weight training, but very little cardio. I am also not tired all the time like I used to be. I went from a size 8-10 to a 4. It works. my mother in law has lost 17 pounds in the last 3 months, and my father and law just started 1.5 months ago and is down 26 pounds. I just started the plan today and can’t wait to see the results! Ive tried this for less than a m0nth and i lost 5lbs with just eating no flour,no sugar. I saw a friend of mine who has lost 40 lbs in the last 8 months and she was on this diet. I’d love to hear of anyone else who has tried this. Sue said it was very easy to stick to.